Amazing Amethyst is indeed amazing! I love this color. This is actually exactly the purple ink I’ve been looking for. It is medium dark and is purple with a slight bit of grey to it. It is completely different than Damson which was a bit too grey and mauve for me though still a nice color. This Amazing Amethyst is going to be my Edison ink. (I should have my pen in 2 weeks) I really wish they would make this a regular ink and sell it in the big bottles. I really like the Lavender as. It is good and bright. It reminds me of Waterman Violet or Levenger Amethyst. Marine is a gorgeous blue-green. It is almost exactly like Steel Blue except it is probably 50% less green and a couple shades lighter. So all of you who didn’t like Steel Blue because it is too green might like Marine. 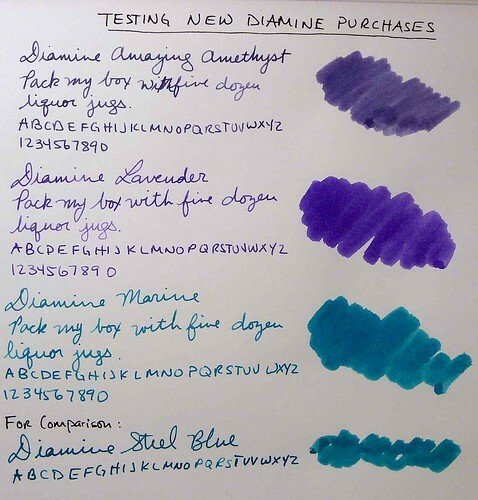 The only one of these Diamines I’ve tried is the Steel Blue (in one of those Peartree samplers). I liked it. I love these inks! Great site. I found you through Pocket Blonde. I do Does This Pen Write.